This easy chicken recipe for kids is quick to make, is a kid favorite meal, and some of the most delicious chicken you’ll ever make. Chicken thighs are seasoned and baked into a delicious & quick dinner recipe for kids. This baked chicken thigh recipe is very easy to make. It’s perfect for those not yet comfortable in the kitchen, college students, and busy parents alike. This recipe is gluten-free and keto friendly. It can be made with bone-in chicken thighs or you can substitute boneless chicken thighs if you’d like as well. The flavor makes guests and family members think you slaved over dinner when really it will take 5 minutes to prepare the dish and you can relax while it bakes. What they are: Chicken thighs are a portion of the leg that is referred to as the “dark meat”. The meat has a darker color and a higher fat content than “white meat”. As a child, my siblings and I always argued over who got the dark meat – it tasted the best! Chicken thighs also have a tender texture compared to the more chewier chicken breast. Why they’re a great buy: Chicken thighs are everywhere for good reason. They are an exceptional value. Not only do they deliver the most flavor of any cut of chicken, but they are also far cheaper than chicken breast. This popular cut of chicken comes with both the bone and skin removed. It’s quicker-cooking than bone-in thighs. This cut will run you a higher price tag as there is extra work done to the product. If you’re looking for chicken recipes for kids and are used to using boneless, skinless chicken breasts, try these instead. They have more flavor and will be more moist than chicken breast, and kids love them! Chicken thigh recipes for kids are go-to meals at my home. I used to stay away from bone-in chicken thighs because I wasn’t sure what to do with them and I wasn’t sure how my family would like them. I quickly found out the first time I made them that kids love chicken thighs! I typically made chicken breasts before this and I think my kids were amazed that chicken could be so juicy and moist, they ate their dinner that night with zero complaints and I was hooked on chicken thigh recipes for kids. I have developed many recipes over the years utilizing this inexpensive and delicious ingredient. 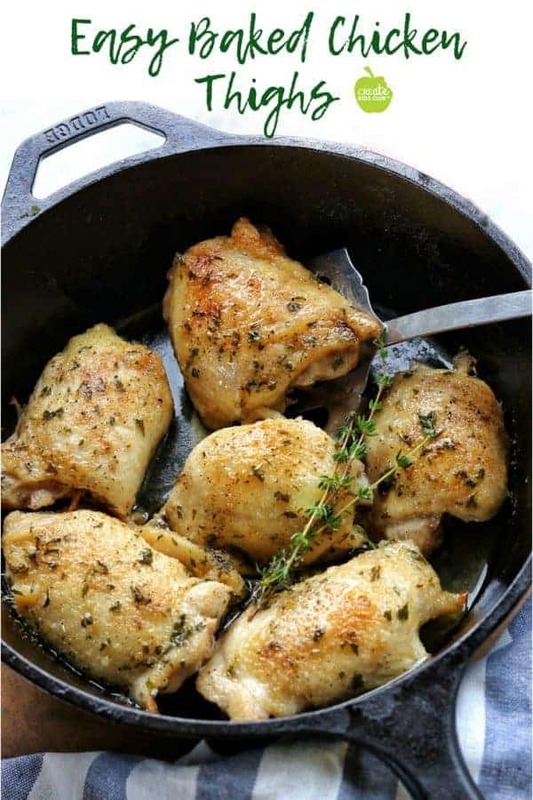 Check out Crockpot Chicken Thighs for another simple chicken thigh recipe along with Chicken Cacciatore and Coconut Chicken. My daughter’s all-time favorite meals Chicken Pot Pie and Crustless Chicken Pot Pie along with Crockpot Mexican Quinoa Chicken, Chicken Tortilla Soup, and Chicken Enchiladas. Making chicken thighs in the oven is a great way to get moist juicy chicken on the inside and crispy finger-licking deliciousness on the outside. Follow these instructions if your chicken is not frozen. To cook bone-in chicken thighs from frozen, simply increase the cook time to 50-60 minutes. Make sure the internal temperature reaches 165 degrees using a thermometer. Not sure your thermometer is working correctly? Did you know you can quickly make a few adjustments to calibrate it for accuracy? Check out my post about How To Calibrate a Thermometer to ensure your kitchen thermometer is working properly. I believe using a thermometer fixes many kitchen problems when it comes to cooking meats. Kitchen Tip: For more flavor, while cutting fat and calories, bake the chicken thighs with skin on, then take it off after cooking. If you want to cut back on calories and fat, simply remove the skin before cooking. 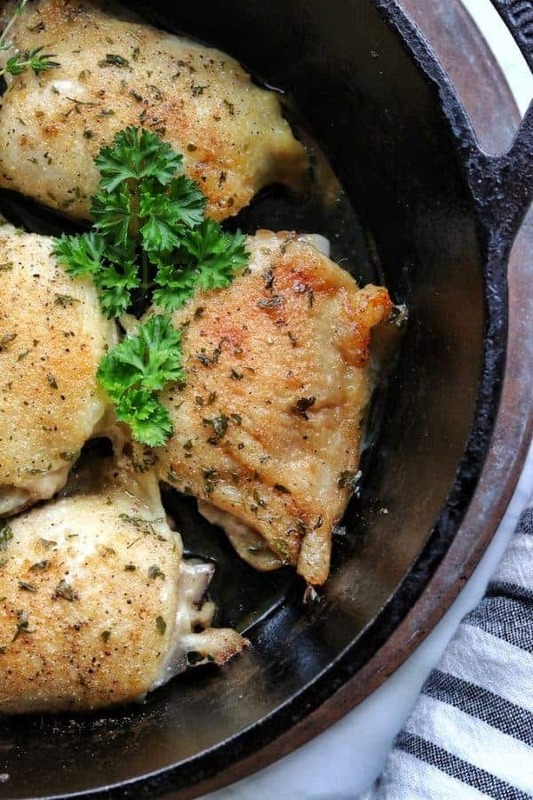 You can bake chicken thighs from frozen or defrost them first. It’s pretty easy to do. For 1 lb of meat, it should take about an hour to thaw the chicken thighs. Kitchen Tip: For more ways to safely thaw meat check out this article by the USDA. Use this dinner recipe for kids and simply swap out the spices for a completely different flavor. These combos make delicious chicken thigh recipes for the oven. Upgrade this chicken recipe for kids even more by baking on a baking sheet with an assortment of veggies roasting alongside. Simply drizzle veggies with a little olive oil and season with salt and pepper. Let them roast while the chicken thighs bake in the oven. For more sheet pan dinners, check out these delicious and simple recipes One Pan Chicken Sausage and Vegetables and Sheet Pan Pork Loin with Veggies. If you’re looking for something a little more exciting than roasted vegetables as a side dish, I highly recommend cheesy potatoes, mashed potato bites, green bean satay or baked zucchini crisps. These chicken thighs make delicious leftovers. While you can reheat them in the microwave, they are much crisper and moist if you reheat them in the oven. Chicken Thighs For Kids are an easy dinner idea. Kids love the flavor of chicken thighs, use bone-in or boneless. Learn to make crispy, moist chicken in just 30 minutes. Thanks for the recipe! Although I’m vegetarian, my husband isn’t and chicken is like his weakness haha. I will totally pass him this recipe and he’ll be so excited! Thanks for sharing and your photos loos phenomenal! I’m bookmarking this! 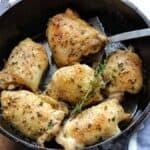 I’m a vegetarian but my husband loves chicken thighs and I never make them for him because I couldn’t find an easy way to make them! This is perfect! You can’t get much easier! I hope he likes them! Chicken thighs are definitely one of my fav things to cook. They’re so easy and versatile and CHEAP! I love how you can make a lot of frugal recipes with them. So simple and delicious! I don’t cook chicken thighs nearly as much as I should. They’re so much more flavorful! Chicken is my favorite and I’ve always been pro chicken thighs despite the bad rap! Will definitely keep this recipe handy! I love cooking chicken thighs with the skin on too! Helps keep in the juices and flavours! This looks great . I makes a huge difference in flavor for sure! Thanks for the recipe. Very simple. One question. You noted that you patted the chicken thighs. 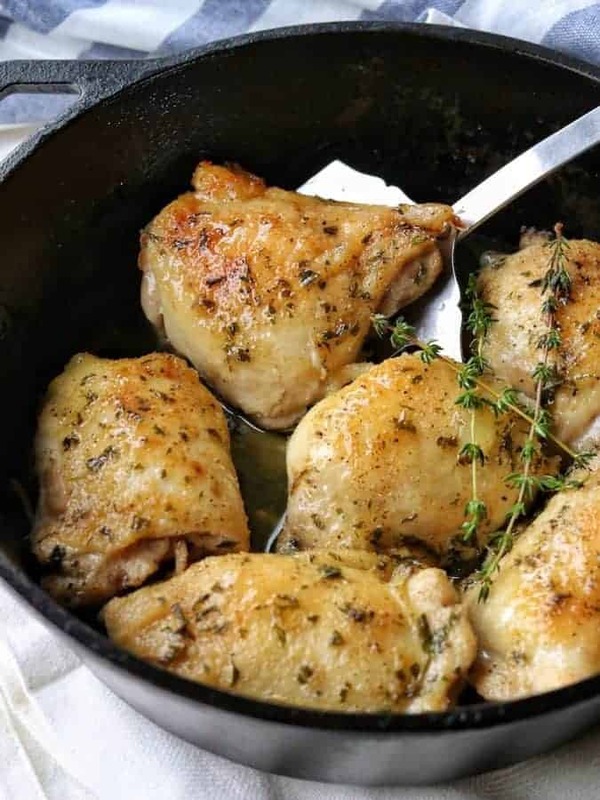 Do you wash the thighs before cooking? Some people do and some don’t. Great question Chris! I live by the belief that washing raw chicken does not clean it. In fact, rinsing raw chicken can spread harmful bacteria such as Salmonella or Campylobacter around the kitchen, which left uncleaned, can lead to trouble. Cooking the chicken to an internal temp of 165 degrees kills all potentially harmful pathogens and is the way I go! 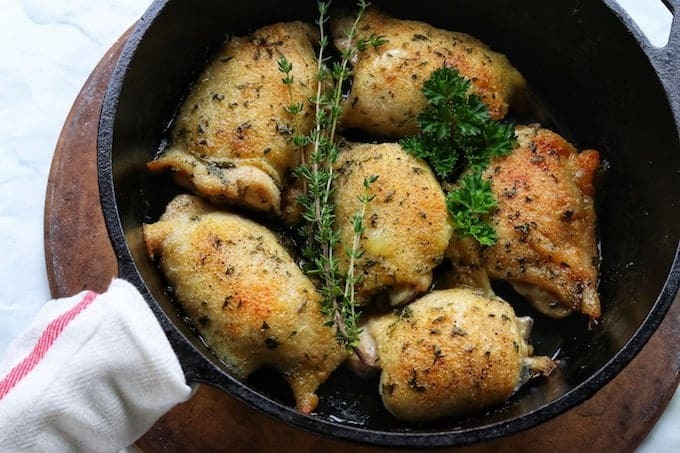 You should be able to follow the directions exactly as written, replacing the chicken thighs with bone-in drumsticks and bone-in chicken breasts. You may need to extend the cook time, however, to cook 40- 50 minutes. Check them with a thermometer to make sure they hit 165 degrees before serving. I’d love to hear how they turn out! Its in the oven as we speak! I am new to cooking (Single male thay resorts to take out) and have switched to prettt strict diet. For me, this is branching out lol im very excited to try it!! It smells amazing! Update: Super easy and super tasty!!! 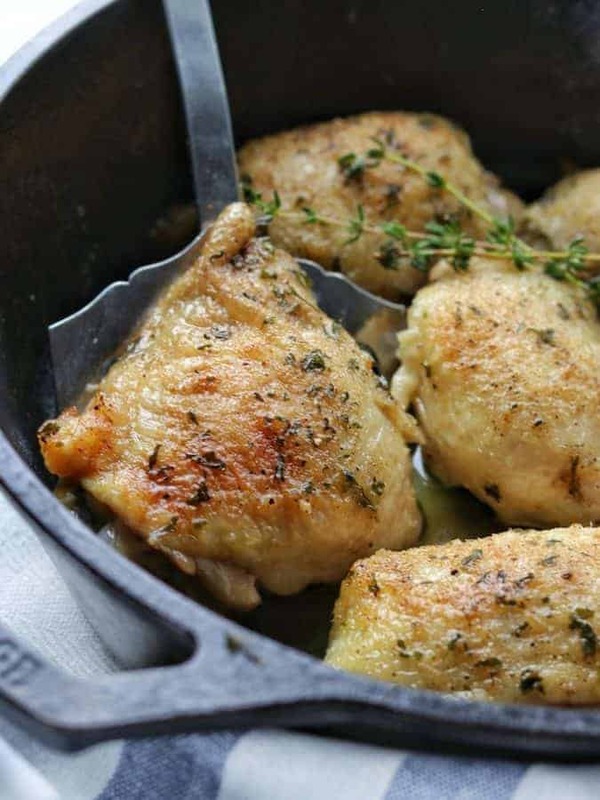 Does it make a difference if in a cast iron skillet or glass baking dish? Hi Carissa! It makes no difference at all! I’d love to hear how you like them once you give it a try! so no oil needed huh? Hi Jahaira! No oil is needed for this recipe. If you’d like to brush a little on top of the chicken before adding the spices that works too. Enjoy!